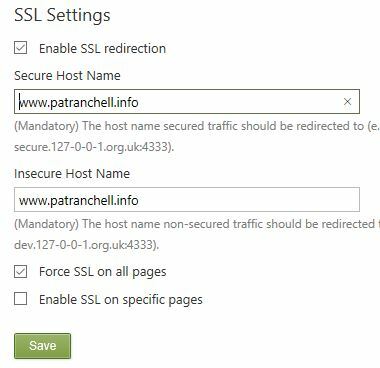 I wanted to move an Orchard CMS site onto https, without paying £$. LetsEncrypt seemed the obvious solution. Once this had taken effect, the LetsEncrypt tool was able to validate and convert my site, automatically adding the https binding. But my site still wouldn't load under https. Hhmpphh. The result...free https encryption, which should auto-renew for ever! Amber Rudd will be upset! Which version of IIS are you running on? I tried this on IIS 10 (Windows Server 2016) but no luck, the extensionless files are still not served. @Pontus I was using IIS7.5, sorry to hear this doesn't work for you but I don't have a Server 2016 to try it out on yet. @Crispin I tried on a site without asp.net an there it worked. Mabe it's something with the asp.net it self. I'm thinking about using a module instead to serve the file. Not the most elegant solution but it works in my initial testing. This solution was EXACTLY what I was looking for. Thanks! On our server, I used Certify: https://certify.webprofusion.com/, to manage the SSL from Lets Encrypt. Don't forget to remove any duplicate mappings for static content. E.g. this is a no-go in conjunction with the above code.